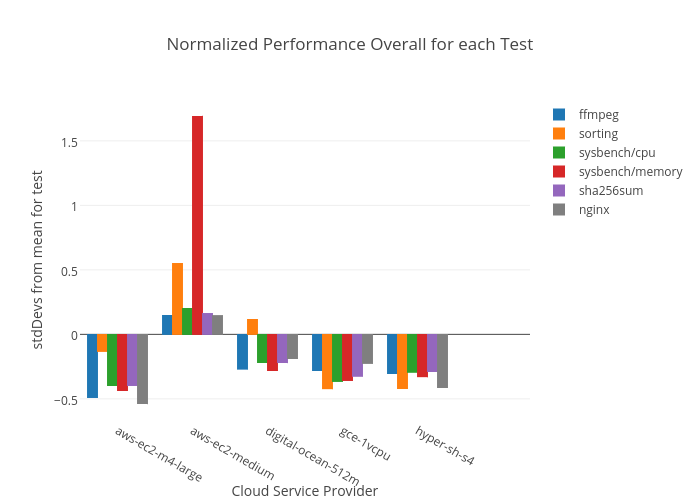 Andychase's interactive graph and data of "Normalized Performance Overall for each Test" is a grouped bar chart, showing ffmpeg, sorting, sysbench/cpu, sysbench/memory, sha256sum, nginx; with Cloud Service Provider in the x-axis and stdDevs from mean for test in the y-axis.. The x-axis shows values from -0.5 to 5.5. The y-axis shows values from -0.6640555555555556 to 1.8170555555555556.